I won’t give you a history lesson about football games. Everyone knows that the days before the FIFA/PES stranglehold was established, football games were presented in a top down fashion and were simple affairs. There were a few games vying for the top spot back then but Sensible Soccer ended up being the best one thanks to its brilliant controls and it is that game, or rather its fleshed-out sequel Sensible World of Soccer (SWOS) that the is the direct inspiration for Active Soccer 2 DX. As the name suggests, there was a predecessor to this game, but that lived out in mobile phone land and this sequel arrives six months or so after the Xbox One version and it offers some simple, retro football action for those of us who don’t mind losing the infinite modes, options and licenses of modern football games and while I’m a fan of the idea, these retro values do come at a cost. Your basic choice of modes here are exhibition matches, tournaments (either pre-created or custom) and a career mode that sees you taking your favourite team and trying to get them to the top of the footballing world thanks to your skill on the pitch and a few decent transfers from the game’s huge player database. It is exactly the same, in intent at least, as SWOS even down to the front-end which takes the exact design as its inspiration and recreates it, albeit with slightly clumsier result. On the Vita, the touch screen controls here are awful (pressing an option once can see it auto-repeat quickly enough to toggle itself back off and the there is no indication that you’ve pressed anything during some of the brief loading periods) and visually it all looks a lot cheaper than SWOS did. There’s a carelessness to it with certain words not fitting the boxes they are in. The fuzzy disclaimer text as you load the game refers to an editor that isn’t in the game. Also, on the Vita you only have the option for exhibition mode and career mode, but career mode here is actually the tournament mode (and the actual player-manager, SWOS-style career mode doesn’t exist). It’s all a bit shoddy. Before you get on the pitch you also get to pick from a couple of control layouts (each of which uses the four face buttons rather than the usual one-button control method) and you get to pick a couple of visual options. The game can be displayed in the traditional vertical view (where you play up and down the screen), horizontal or diagonal (which is how the early FIFA games did it before they realised it was rubbish). I found the vertical view a little limited (as you can’t tell exactly where the goals are some of the time) and stuck with the horizontal one. You can also pick the camera distance, I opted for the nearest one because otherwise it is almost impossible to tell which players are yours as their kit colour doesn’t leap off the screen (see screenshot above for an example). But not in a game-breaking way. Once you are on the pitch, you get a slightly different experience depending on which format you use. The Vita struggles noticably when the players take to the pitch but it does settle down, however the game never feels that smooth. On the PS4 things are much better but it is playable either way. 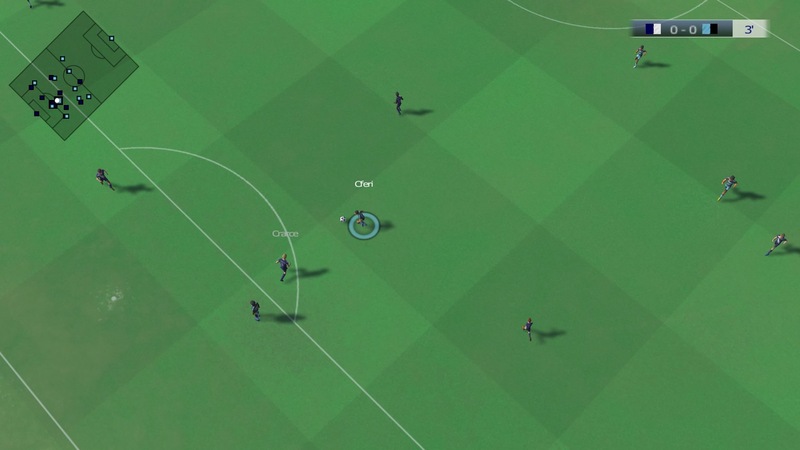 Unlike the much-maligned Kick Off Revival, the ball sticks to your players, making it all a lot more playable. The game whips around at quite a pace too and it is actually enjoyable. They say that scoring is the hardest thing to do in football and that is definitely the case here. In all the matches I’ve played, I’ve had dozens of shots and mostly walked away scoring one goal or none at all. Occasionally, I’ll bang in a few (my last game was a 5-0 murdering) but it does seem that ultimately I’m on the offensive nearly all the time and it is just the wayward shooting keeping things respectable. I tend to see the ball ping back off of the woodwork a handful of times in every match for some reason. It doesn’t feel random given that it happens so often, as if the game is keeping the score respectable but as you learn the higher percentage angles to shoot from, you will start doing better. One issue is that the set-pieces are terrible. 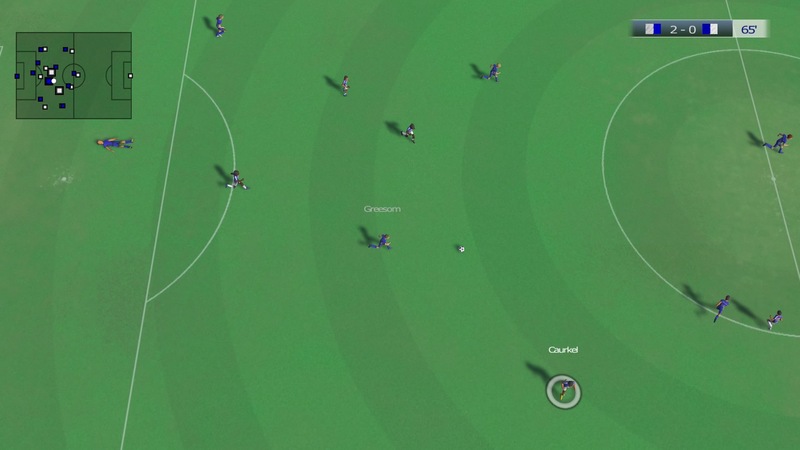 Aiming penalties is done by positioning your player, making them quite predictable in multiplayer matches – although heavy use of aftertouch will hide your intentions but your still giving something away. Free kicks are really odd. You kind of rotate your player around the ball in a way that never feels intuitive before you take the kick. Corners and throw-ins also seem to have a mind of their own too. I’ve kicked a corner off for a goal kick a yard away without even aiming. It’s not as unfriendly as Kick Off Revival but it is still pretty bad. A tutorial mode is on offer but this crashed my Vita outright (the first time this has ever happened) causing me to have to reset the unit. However, beyond that there aren’t too many problems on the pitch. It’s playable, and even fun if you fancy a casual little kickabout. If you want more depth, the career mode (on the PS4 version) adds it. However, this mode could have benefited from some major playtesting. So, here’s the thing. I was kind of enjoying the mode and decided I’d sell half of my squad because you only really need your starting eleven and a bit of cover. I sold one forward which then moved my twelth player into the eleventh slot. That player was, by default, my reserve goalkeeper. The problem is that when you are selecting your match day squad, you can’t replace your goalkeeper with an outfield player. Even if you’ve got a goalkeeper in the striker position. I can’t do anything but swap him for another goalkeeper. So I then had to sell my reserve keeper in a swap deal with an outfield player. Rubbish. That could have been game ruining if I didn’t figure out the way around it and it is just another example of what happens if you try to recreate a legendary game without the technical chops and professional pride it takes to pull it off. Instead of a modern take on a classic, you just end up with a cheap facsimile. There’s just a level of care that is lacking throughout the game. 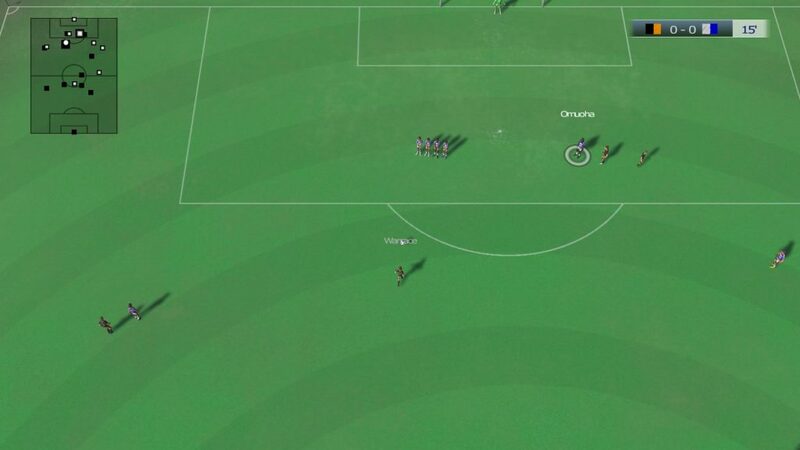 Like when the radar/pitch map stopped showing any players on it for some reason (permanently I might add) or when I scored from a rebound in a penalty shootout and it counted. With all that said, Active Soccer DX 2 does play a reasonable game of football but times have moved on so much though and the days of putting up with player names like Areq Snitfies (Alex Smithies) and Gland Harr (Grant Hall) while wrestling with poorly designed menus and badly playtested gameplay are behind us. Even at eight quid, this feels like we just got stung. * Note to readers/comment writers. Please note that while we were disappointed with the performance and content of the release version of the game, we will be monitoring the progress of the game and amending our review if it is improved. Active Soccer 2 DX is what happens if you copy a twenty year old game but forget to put in any pride, professionalism or playtesting. It's better than Kick Off Revival though. And that's what we in the business call the faintest of praise. This review is too harsh. It’s definitely rough around th edges and the career mode bugs need ironing out but it’s the best 2d soccer game to come out since the golden days. And the reason why is because it isn’t a copy it’s just inspired by the old games. Active soccer 2 DX has its own character as soon as you turn off all the control support settings and put it on hard difficulty which is how i assume it is meant to be played. The graphics can sometimes be a bit scruffy but I’ve never seen a football game which seems to have so many different ways to score. Especially a 2d game. I’ve not seen an exact replica goal yet, the amazing SWOS’s greatest downfall. If you don’t make comparisons and are willing to gloss over some of the issues there is a true gen of a soccer game here. Support the one man team because I can see this series getting better and better if he gets a chance to make mor Active Soccer games. Hi, Chris. I think that in a patch or two’s time we’ll see the game Gianluca intended to make all along. We can only review the release version initially though but will adapt our reviews. We did that with Viva Ex Vivo for example. Worth noting also that the dev made a few claims on twitter that don’t stand up. 1. He said the career wrecking transfer bug was “a rare bug” when it wasn’t. It happens 100% of the time if you sell a current first team player. 2. 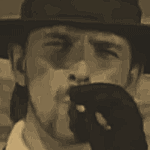 The 8.4 score average on PSN means nothing. You won’t see many games below 8 (Kick Off Revival is 6). Mastercube got 8 on there when it is a barely functioning tech demo at best that is worse than any other game ever made. 3. Hundreds of leagues on the Vita version doesn’t mean ‘depth.’ FIFA on the Vita has way more depth of gameplay, just less stats. We note that the patch will change points 1 and 3, but for now, two weeks after release, these points stand. Dear Richie, I explained to you clearly that you can’t submit patches on holidays. In fact the Vita patch has been submitted yesterday adding career mode while PS4 version will be submitted tomorrow. Yes, I’ve noted that, Gianluca. I’m just addressing every point that is being made, that’s all. Treat the patch as a separate issue. We will. But in terms of other claims made, they never held up. Can anyone help please ? How can you get the in game pitch map / radar to show were players are during a match ? Mines always blank. Im still enjoying it despite this. Great fun. Gary, it did work on the Vita for a while but now I’ve got a blank radar too. Patch incoming though. Might fix it. The Vita and PS4 patches have been submitted days ago and we must wait a little bit to be online. About the PS Vita radar i will check it and eventually fix it in a next Vita patch, although the new upcoming patch may already fix it. PS4 – this patch fixes the career selling bug which was the major issue with that version. It also adds career mode which is a bit unpopulated but is a nice addition. It worked well when I found a match. These push the PS4 version up to a 5. 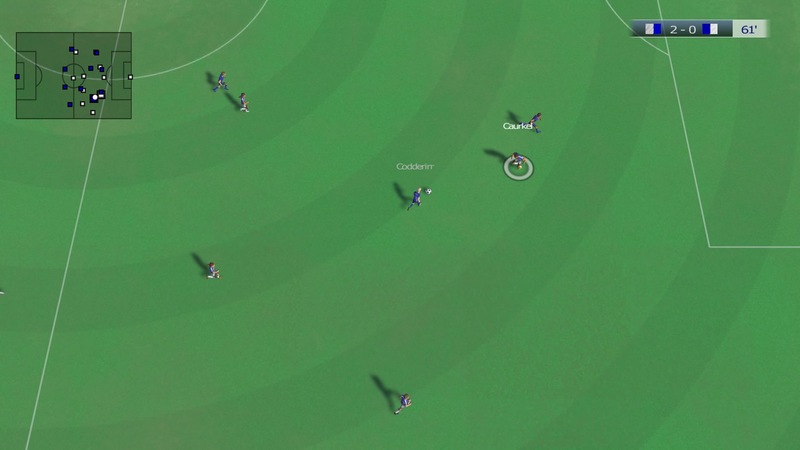 Vita – this patch adds career mode. I tried to test the selling bug but every time I sell a player it crashes the game. Lack of auto-save means you can lose a lot of progress too. Performance still a bit rough. Score still a 3. Game not improved yet. Front end still as unpleasant as it was. Will update review properly soon but am disappointed with the Vita patch. 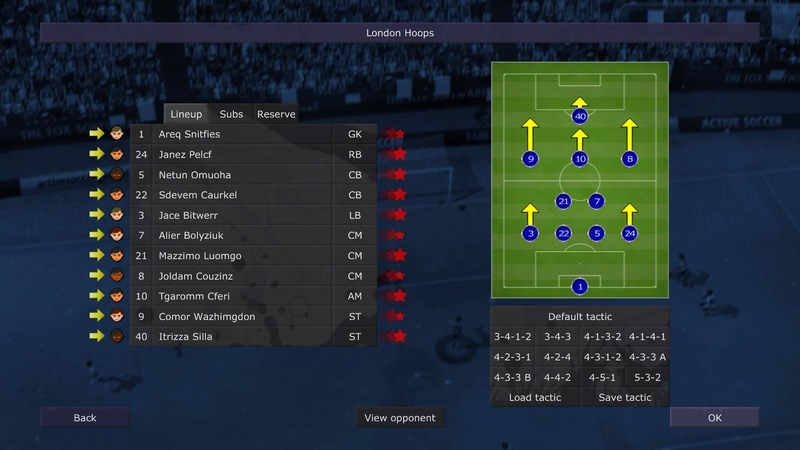 Vita/PS4 cross save would be a nice feature for career mode. I hope it gets added. In the meanwhile I am working on a newer patch (1.03) that will improve both versions. Richie is right, at the moment if you use PS Vita touch screen and go back on market menu, the game may crash. In the meanwhile I suggest to use only stick and buttons instead. The 1.03 patch will be available in 2-4 days and it will also add an interesting feature: auto player selection sensitivity. Everyone can choose the auto switch as they prefer. nobody talk about it. But it’s awesome. I was addicted to SWOS on the Amiga. Still the best game of it’s type, ever. I wish Sensible Software would do a PS4 version. Can I just say that edit mode is included, contrary to your review Ritchie.